I am back from a magical trip: a workshop in the Turkish Aegean. The focus of this workshop was holistic treatment of children with various physical and mental difficulties and illnesses. We treated and supported them alongside a group of wonderful therapists and coaches. In cooperation with Matthias Mösle, head of the Upledger Institute in Switzerland, the idea of offering a combination course of Cranio-Sacral Therapy and dolphins in Europe was created. Hello Everyone, I wanted to send you more videos when we got back home. We have been back since Friday, we are overjoyed because we can really see how Timo develops with every new day. On the last day there were cuddly dolphins for the kiddies, (thanks once again to the team for that) and what can I say: Timo actually said “Daisy”, he hasn’t repeated it but it gave us soooo much hope. 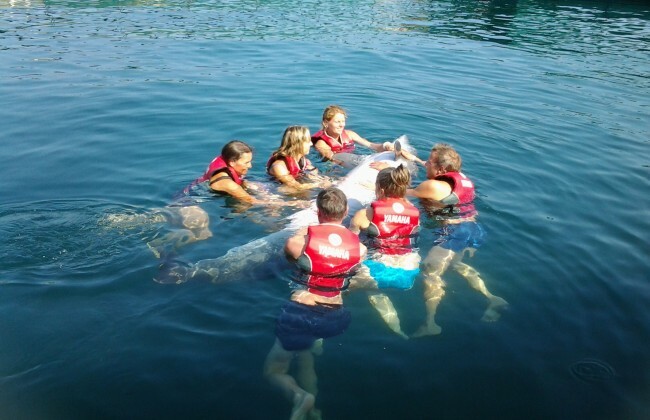 It was a wonderful time we spent with the team of the Dolphin Therapy Centre in Marmaris, a superb Team, one that really works with heart and soul. Many thanks once again. the year is drawing to an end and it is the time to recollect all the memories and expectations of the past year, and make plans together for the future. We send a hearty thank you to all the children, Families and Relations, and dolphin friends for the lovely memories and trust that you have given us. Things are a little calmer now in Marmaris, the days are shorter and gradually cooler. However it is not a true Winter without snow. 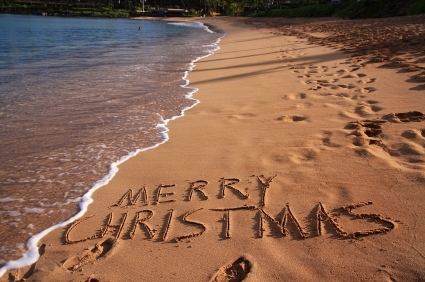 As we miss the usual Winter chaos we would be pleased to see a photo, a drawing or greetings on our Facebook web site. 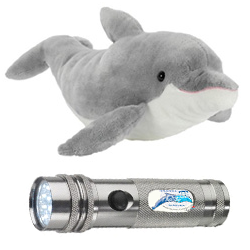 This year we would like to present a little Tombola: Under all participants who have a small or big child, we would like to raffle our 50 cms cuddly dolphin soft toys and our smart LED Torches for the dark Winter period! Everyone who would like to take part, just write in addition on our Facebook page: “Yes, we would like to take part in your Raffle”. The whole Onmega Dolphin Therapy Team in Turkey and Mega-Sport-Reisen in Germany, including our dolphins Daisy, Frosia, Splash and Flipp wish you a happy and relaxing Christmas and and all the best for the coming year. Found in Internet: Underwater video of a dog swimming with wild Spinner Dolphins. After over a year of argument with the Whale and Dolphin Protection Forum (WDSF) over various claims made over our Therapy Center, at long last the WDSF has acknowledged the judicial order made by the OLG Hamm prohibiting further such claims. As already reported, in May 2011 we instigated a court injunction against the WDSF that prohibited certain claims they made to injure our reputation. 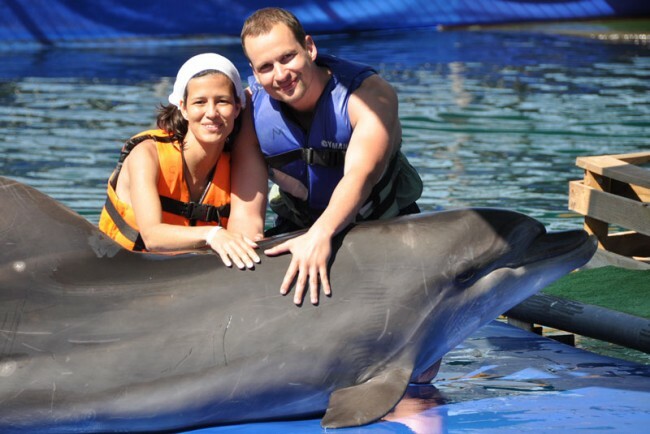 These claims that the WDSF made in their Boycott Campaign, which covered all dolphinariums in Turkey, including our Onmega Dolphinarium, were unacceptable; many statements concerning hotels and travel agencies, and pictures of Dolphinariums, were mixed up to coat all such facilities in Turkey ‘with the same brush’. Our Dolphin Therapy Center compared to other Dolphinariums in Europe is the largest, and unique in that it has its dolphins swimming freely in a sea water dolphinarium. We strictly adhere to the German Animal Protection Standards and place great importance on how our animals are held, and on our qualified personnel. Our main intent of the said injunction was to stop the WDSF spreading false rumours that were obviously intended to injure our reputation. The Landgericht Hagen as also the Oberlandesgericht Hamm in the course of this injunction examined the claims that had been made. Even though certain statements were protected by freedom of speech, the OLG Hamm prohibited the WDSF to publish claims that our dolphins were kept in small concrete pools, or that they were caught in defiance of the law against capture of wild animals, that they had scars and deep wounds, or were molested by kicks from spectators. Furthermore, the WDSF is prohibited to claim that they were threatened by us, and that we are enmeshed with the authorities in Marmaris. The WDSF has also been forbidden to proclaim a Boycott and show their film, on Internet, that bunches all the various dolphin facilities in Turkey together, making false statements about our Dolphin Therapy Center. The ruling made by the OLG Hamm is res judicata and has been accepted by the WDSF. Because of the one-sided Reports made by the WDSF together with the court proceedings it is our wish to rehabilitate our Dolphin Therapy in this way, as we also support initiatives that are against the holding of dolphins in too small or inappropriate enclosures. With respect to our friends, Patients and their families, we could not take such injurious allegations lying down; these allegations have now been prohibited by a court order which has been accepted by the WDSF. We are of course ready to answer any questions you may wish to ask. Dilsah Sue is nine years old. She can walk, chew by herself and focus with her eyes. She lets herself be touched and makes noises. That was not always the case. 5 years ago the girl was tube-fed. The Doctors had no hope. But Dilsah Sue dumbfounded all prognoses. Five years ago the ‘Neue Westfälische’ reported the lot of the little girl for the first time. 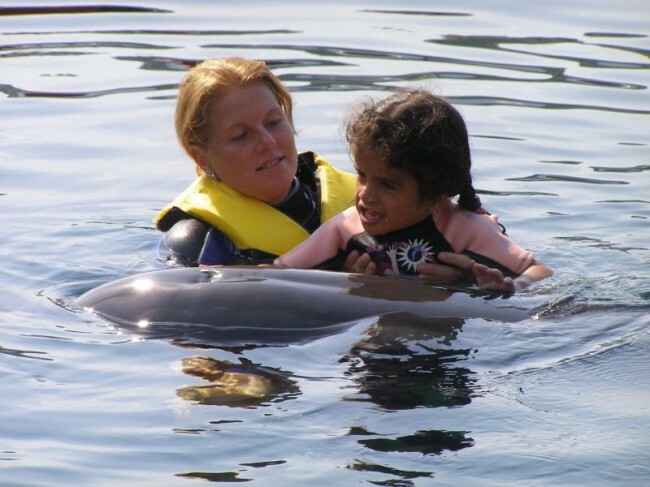 Dilsah Sue’s family were trying to collect enough money for a Dolphin Therapy. Many people donated and made the alternative treatment possible, which radically changed the life of the family. we would like to give a hearty thanks to all our young patients and their families, and also to all dolphin friends, for their trust and support. 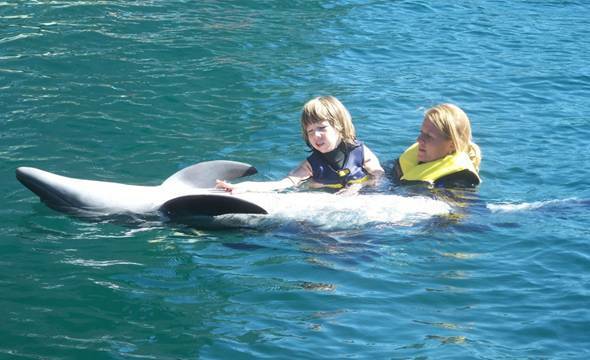 All the unforgettable hours of joy shared in our Dolphin Therapy Center in Marmaris will remain in our hearts. The whole Onmega Dolphin Therapy Center Team and Mega-Sport-Reisen including our dolphins Daisy, Frosia, Splash and Flipp wish you a merry and restful Christmas and a peaceful New Year blessed with good health. We are happy about our new team member and to announce our new country website for Dolphin Therapy in Hungary. Csollák László is happy to answer your questions about our unique therapy approach by swimming with dolphins and is here for your concerns about dolphin therapy in Hungary. We have recently, on more than one occasion, reported on the activities of the Whale and Dolphin Protection Forum (WDSF). Without making any differentiation to the various facilities the WDSF is campaigning against all the dolphinariums in Turkey. In conjunction with this they are calling for a boycott for dolphinariums by Travel agencies and Hotels. as perhaps some of you already know, during the Winter of 2010/2011 we moved 70 metres from our Container locality to rooms in the Hotel Mares. 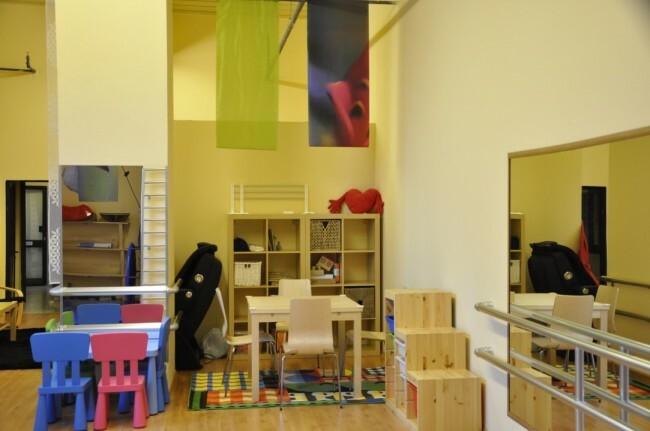 Even though the move was combined with a lot of stress, we now have many new and pleasing facilities. We still have a view to the sea and a comfortable sea terrace.